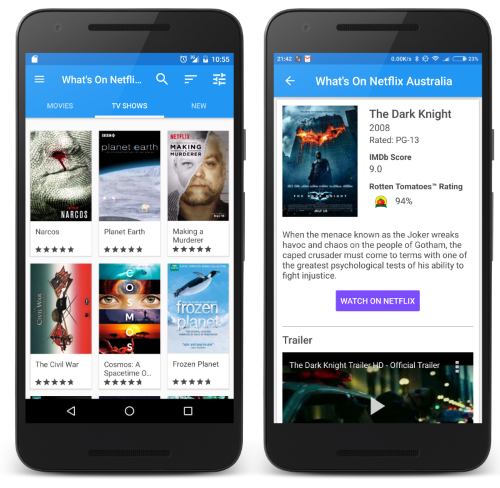 The fastest way to find the best movies and TV shows on Netflix™ Australia. Ever wished you could see what's on Netflix Australia using filters like IMDb™ Rating or Rotten Tomatoes™ Score? Now you can! Show the time of your next alarm in a widget on your home screen and in your notifications. Optimized for Xiaomi's MIUI interface, but can be used on all Android phones and tablets. 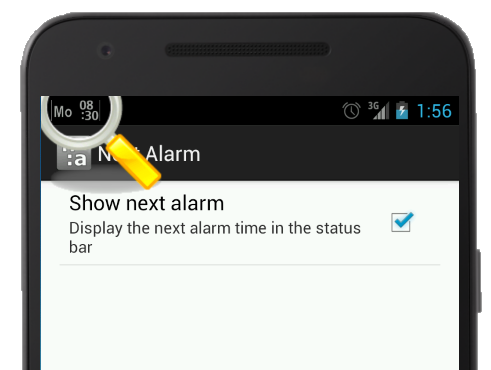 Show the time of your next alarm in your status bar and in your notifications. Have problems with your data connection when you leave a wifi hotspot? 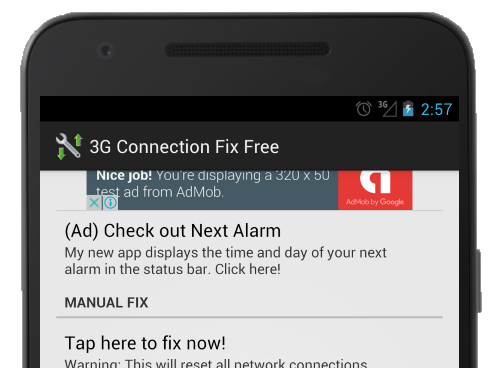 This app could fix your problem, not just once, but will continue to fix it every time the problem happens! Supported on phones running Android 4.4 and earlier. Create apps for Android that are a delight to use and add real value to using your mobile device, with no compromise in performance. 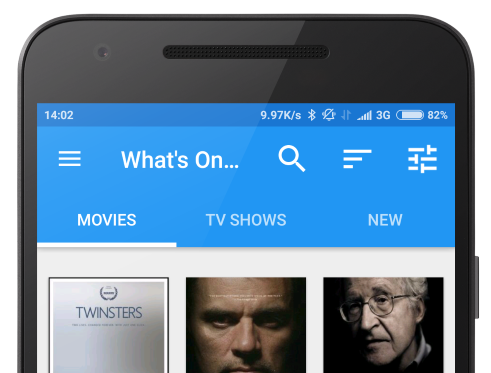 Passionate about entertainment and streaming media, I build apps to help you find the best media to watch. I understand the Android system, and make improvements through apps. The cloud powers most of the functionality of your smart devices, my apps help you stay connected. Solved all my problems! Device Optimus 2X (P990) Had problems with connectivity with mobile data, no incoming arrow. Apparently the data signal gets frozen. 3G connection fix totally fixed it, I have a H signal all the time! Superb. This app makes my Nexus S useable!!! Prior to installing it I was never sure I had 3G reception even for incoming phone calls ("I called you three times and all I got was your voicemail"). Google, Samsung, and AT&T disavowed ownership of the problem and I was forced to rely on 2G (menu option on the phone) which is slow and spotty as it's being discontinued. I haven't had a problem since installing this app about two weeks ago. Now my question to Google - if a software app can fix this problem doesn't that seem to indicate software? Running ICS on the Nexus. Gr8t and works as stated. My Samsung galaxy Beam never displayed 3G network everytime am out of the US and step into Africa. After installing this app I hv been able to watch movies online steadily. Thank u guys. use to be next to impossible to connect my samsung 3g at home even though i have a wireless router. just downloaded the app and the difference is amazing. Highly recomended I was having intermittent 4G service problems and my 3G antenna wouldn't come online when 4G signal was lost. Now everything works the way it is supposed to, I would highly recomend this to anyone with the same issues. Android is a trademark of Google Inc. Google Play and the Google Play logo are trademarks of Google Inc. IMDb, IMDb.COM, and the IMDb logo are trademarks of IMDb.com, Inc. or its affiliates. Flixster, Rotten Tomatoes and the Certified Fresh Logo are trademarks or registered trademarks of Flixster, Inc. in the United States and other countries. Netflix is a registered trademark of Netflix, Inc.